Policymakers who care about the level of educational achievement and attainment in the United States should pay careful attention to the nation's rapidly changing demographics. The Obama administration has been pushing policies aimed at meeting the president's goal that the United States lead the world in educational attainment by 2020. Some progress has been made, with the bachelor's degree attainment rate among 25- to 29-year-olds edging up to 34 percent in 2013 from 28 percent in 2006, after a decade of stagnation. But this progress may be threatened by rapidly changing demographics. The fact that non-Hispanic whites no longer account for a majority of U.S. students is largely explained by the increase in the percentage of Hispanic students, from 14 percent in 1996 to about 25 percent today. 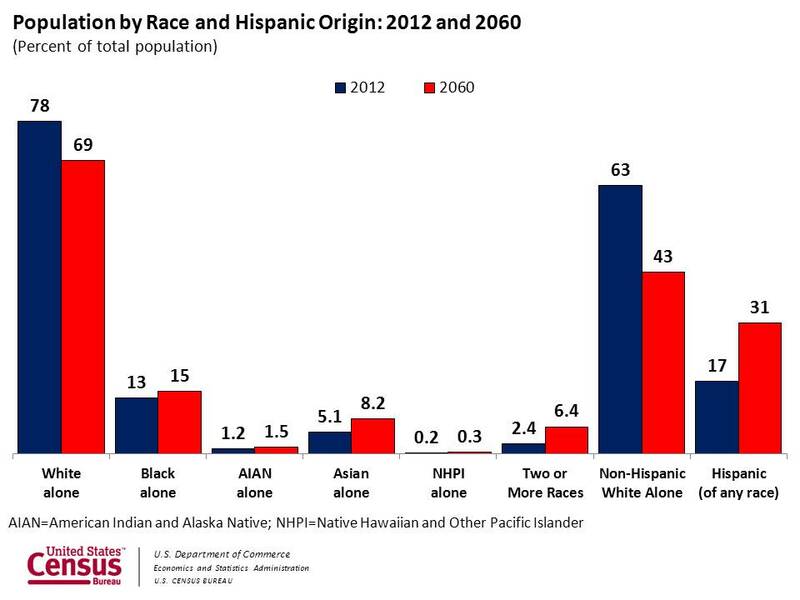 That percentage will likely continue to increase, as the Hispanic population in the United States is projected to grow from 17 percent in 2012 to 31 percent in 2060. This fact is illustrated by U.S. Census data on educational attainment, with 16 percent of Hispanics ages 25 to 55 holding a bachelor's degree or higher in 2013 as compared with 38 percent of non-Hispanics. As the Hispanic share of the population continues to grow, the overall attainment rate will fall if attainment stays constant for each group. As my coauthors and I wrote in our 2009 book, Crossing the Finish Line, "It will not do to concentrate efforts on improving outcomes of college-bound upper-class white students ... if for no other reason than that there are not going to be enough of them." Educational success correlates not just with ethnicity, but also with country of birth. U.S.-born Hispanics have a bachelor's degree attainment rate nearly double that of foreign-born Hispanics (21 percent vs. 12 percent), whereas immigrant non-Hispanics have the highest rate of all—51 percent, as compared to 36 percent among U.S.-born non-Hispanics. Making it easier for well-educated individuals to come to the United States is one strategy to raise the human capital of our population, although significant reform to immigration policy seems likely to remain out of reach politically for the foreseeable future. Making serious progress on the attainment issue will require renewed focus on the needs of all students, especially non-traditional college students. A recent Brookings Institution report highlights some ways to help these students who do not look like "typical" college students, but who constitute a majority of the college-going population. These recommendations include changing the Pell grant program to facilitate year-round enrollment and enhancing federal data-collection efforts to better represent the outcomes of nontraditional students and provide more useful data, such as information on employment outcomes, to help students make better-informed college-going decisions. These challenges are daunting, but optimism is warranted given the fact that increases in attainment have occurred in recent years alongside demographic shifts. This occurred because improvements were shared across demographic groups, with bachelor's degree attainment increasing over the 2003-2013 period from 12 percent to 16 percent among Hispanics and from 33 percent to 38 percent among non-Hispanics. The country will only continue to progress as a whole if these improvements continue to be shared by all Americans. Notes: The bachelor's degree attainment rates reported in this paper without hyperlinked citations are based on the author's calculations from the Current Population Survey. Matthew M. Chingos is a senior fellow at the Brookings Institution, in Washington, and the research director of its Brown Center on Education Policy. He studies a wide range of education-related topics at both the K-12 and postsecondary levels and has written extensively on class-size reduction, teacher quality, and college completion.